This low is forecast to reach TC 2 status and drift around for a while .Just in a favorable position atm as far as shear and dry air ridging but that may all change in a couple of days . But for now he is going to have a bit of a play abeit a short life off the coast of W.A. Low will drive some moist tropical air from the north back towards the Kimberley and Pilbara coast ,for a couple of days anyway. 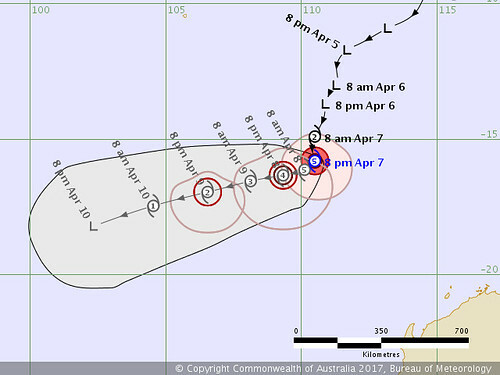 Apparently may go to CAT 3 tonight before decaying back down to Cat 1 within the next few days..
Exmouth] and moving south southwest at 12 kilometres per hour. Doing a right hand turn and moving WSW further off the W.A coast after tonight. 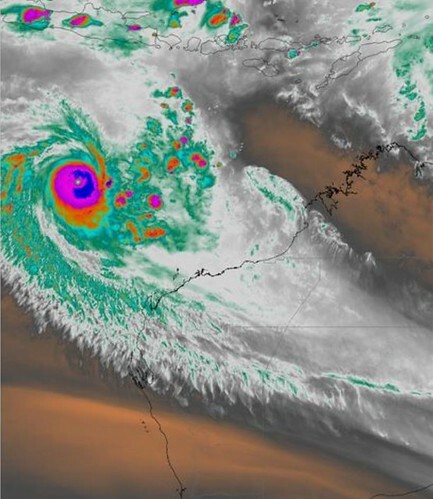 WOWOWOWOWOW check out the sat image of Ernie. BOMBING away out there. Eye and all. That thing is going off its nuts I havn't seen rapid intensification like that for a while CAT 4 forecast for Ernie. Forecast to go CAT 5 WOW. I am gobsmacked. on Saturday or early Sunday as it moves into a less favourable environment. 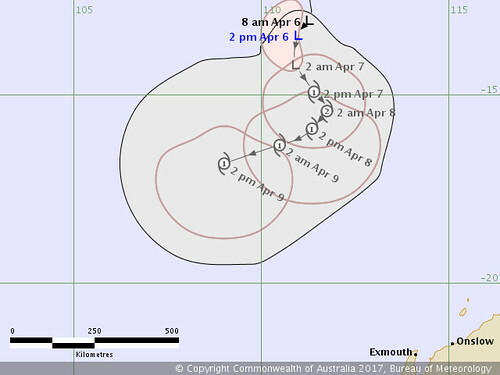 Gales are not expected on Christmas Island or the WA mainland. The next Information Bulletin will be issued at 9 pm AWST. Ernie the mean B@stard. That is intense development. According to the track map it will go from a LOW to CAT 5 in 30 hours. Nasty. Yes just logged on and was like Wozers Earnie. He look beautiful on Sat. Nothing like a Cat5 TC cruising around the Indian Ocean. Amazing shift to high intensity in last 12hours. Cyclogenesis ingredients coming together at the right time. Exmouth] and moving south at 8 kilometres per hour. from late Saturday or early Sunday. Ernie definitely got balls wedging himself between all that dry air. Just sucking in whatever moisture is around ...mainly from the Indon region. TC Ernie has had a purple patch in the last 12 hours going from Cat 2 to Cat 5 . Technical report from BOM at 8.30pm WST. with gales in a more extensive area in southern quadrants. SSTs are 29-30C and ocean heat content is favourable. has further decreased in the last 6 hours to be less than 10 knots. Over the next 12 to 24 hours, conditions will remain favourable with low vertical wind shear, high moisture and warm SSTs. 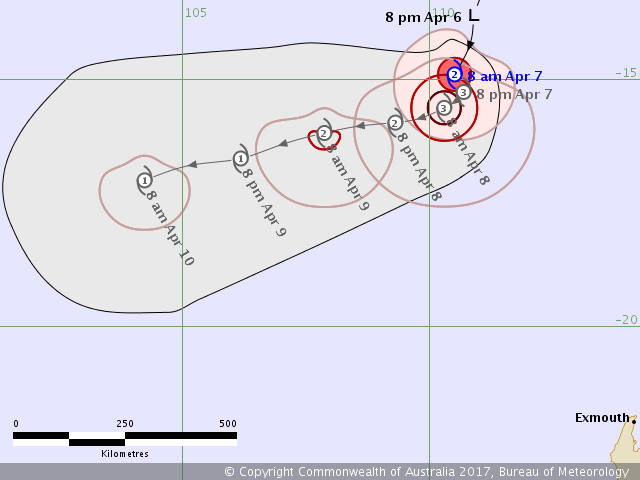 This season has highlighted how inept the BOM are at predicting cyclones. Several of the early lows of the season were supposed to go off, then fizzled; Debbie was never going to amount to much until - well - she did. Ernie wasn't even a concept until two days ago - IIRC the Western Region outlook before then was for a weak low to move away and dissipate by the end of the week. Even when he started to form they didn't suggest anything past Cat 2. I'm assuming it's tricky business and a lot of factors need to come together, but it seems like it's more-or-less guesswork this cyclone business amiright? Model reliance. Guaranteed to get burned. Its proven time and time again. Hey Popeye. Question. Looked at Access-R this morning and it looks as though the system is a mere Low Pressure system. Clearly it's not. Any thoughts.